Winning at Work – IWW helps cafe worker defeat gross misconduct allegations! 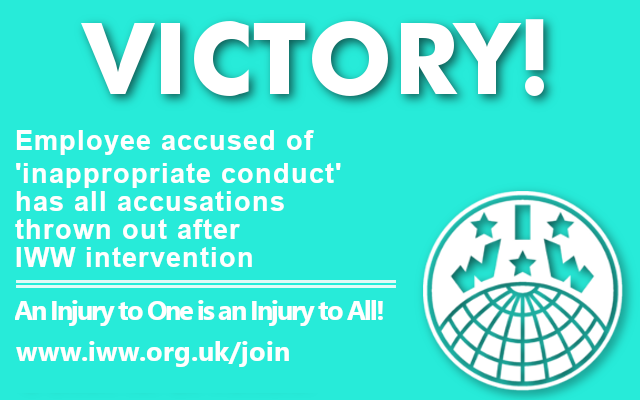 An IWW member in Clydeside IWW who faced false allegations of gross misconduct has been reinstated with no warnings or repercussions, thanks to the timely intervention of IWW reps. Working in a busy cafe in Glasgow City Centre, the member was suspended after raising legitimate concerns about customer waiting times during a busy period, with her boss. Worryingly, after being told to attend a disciplinary meeting at the end of the day and telling the boss that she wanted a union rep with her before attending any such meeting– her legal right – she was suspended and told that she’d be contacted with a disciplinary date. She was not told at the time the exact accusation that she faced, apart from a vague assertion from the boss that they were not going to take feedback and constructive criticism from staff members. The member contacted us straight away and reps met up with them to discuss their case and analyse the situation. Despite repeated texts, calls and emails from the member over the weekend, the employer refused to set a date for the disciplinary hearing and refused to define a reason for their suspension. After a stern letter from the union, they soon changed their minds and sent over the exact accusation of ‘inappropriate behaviour’ and a date for a disciplinary within a few hours! They were informed by email that they would have to attend a disciplinary meeting on 4th January 2019 where they would face a verbal warning. Accompanied by their union rep, our member attended the disciplinary meeting where the employer doubled down on their accusation of ‘inappropriate conduct’ and even went so far as to say that they would not be retracting that claim! The member stated her case calmly and respectfully, pointing out that they were raising legitimate concerns and were unaware of the accepted way to raise them because of the fact that no formal disciplinary and complaints procedure existed at the workplace. Despite the boss attempting to limit their contribution to the meeting, the union rep pointed out that under the Employee Relations Act 1992, it was unfair to expect an employee to know the correct way to raise an informal complaint if there was not an official disciplinary process in place at the workplace, and if they had not been informed of it – two things true to the workplace. They also further stated that the employer had clearly broken ACAS guidelines throughout the disciplinary process, summarily suspending an employee for alleged behaviour that could in no way be considered ‘gross misconduct’. They further stated that it was against the law to refuse to pay an employee whilst suspended and that the employer was breaking the law by refusing the provide the employee with payslips. A day after the meeting, the member received an email telling her that all charges had been dropped, that she would be receiving no verbal or written warning, and that she was due back at work the following week. Upon checking her bank account, she also found that she had been paid in full for the duration of her suspension! A massive success for our member and proof of the power of the union! !